Enjoy Your Horse As Nature Intended! 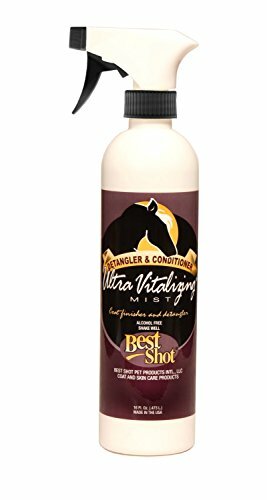 Best Shot's Equine Ultra Vitalizing Mist is a water-based detangle and leave-In conditioner spray. It provides awesome shine leaving manes and tails easy to comb. Recommended for use on a dry coat before brushing, after bathing or for show prep. Best Shot's Coat Release Technology closes lifted hair cuticles to easily detangle and free shedding coat from body. It will help repel dirt and reduces static so your horses stay clean longer. Will not cause saddle slip or leave a waxy feel. Great for dandruff or on itchy tails. Alcohol free, non-greasy and fabric safe. Helps protect the coat from sun damage. Enjoy its fragrant botanical scent. Regular use enhances coat health and appearance. Ready to use. Available in 16 ounce, 32 ounce and gallon sizes. If you have any questions about this product by Best Shot Pet, contact us by completing and submitting the form below. If you are looking for a specif part number, please include it with your message.